My unhealthy obsession with interiors started when I was involved in the “make do and mend” of my current home. Like most people, I had limited funds to do everything all at once. But it’s in fact the process of building up an eclectic mix of “bits and bobs” over time that has now become my eclectic style, where “rustic meets luxe”. But when you start designing for full-scale renovations and residential interiors, it’s a challenge to create a look that’s been built up over time. Whilst it’s an exciting gig where you can buy everything from sofas, rugs to flooring, and accessories all at once – it’s all too easy to fall into the trap of an overly ‘designed’ interior. 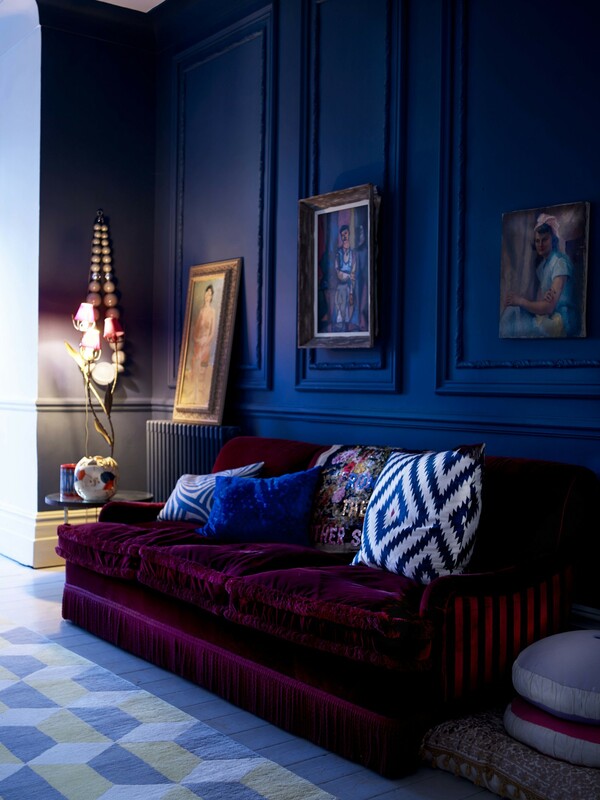 With all the joys of designing a look without many limitations, you do have to be wary that you don’t create an interior that’s too ‘perfect’. 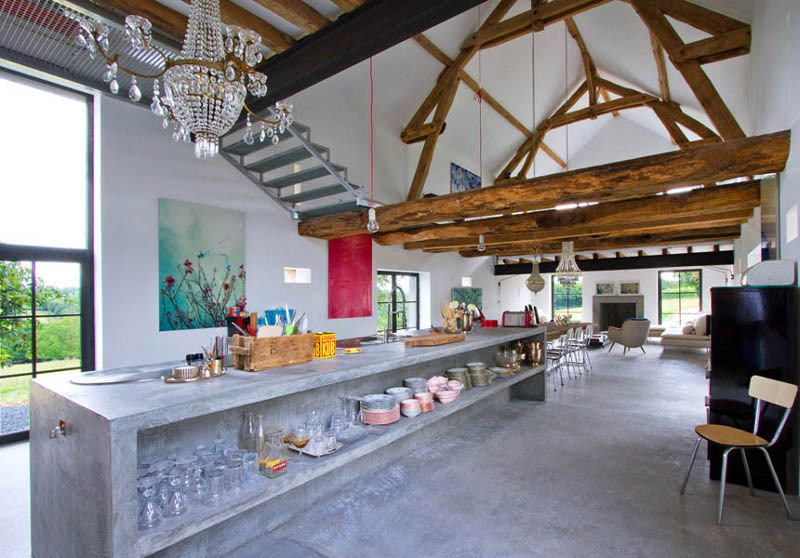 These rustic, rough beams bring natural warmth and depth when mixed with the smooth, industrial concrete. 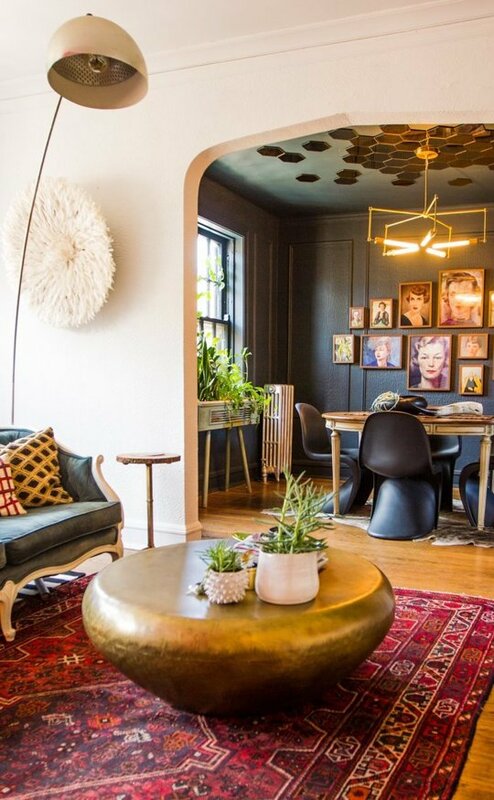 The combination of the glamorous chandeliers and industrial lighting brings some drama to the space. If you prefer flat colours, ensure there’s enough variation in texture. This bright and bold Chicago apartment brings together unexpected furniture that just shouldn’t work, but it does. Cheap and simple ideas such as the honeycomb mirrors on the ceiling look great. 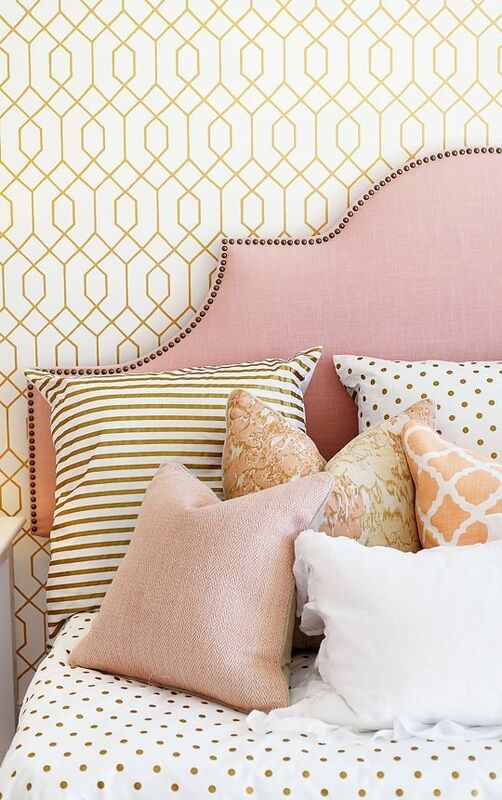 It’s these small touches that will keep your home feeling unique and stop you from getting bored. Adding visual tension, doesn’t have to be expensive…If in time you feel like a change, or your taste changes, these fun touches are simple to replace. 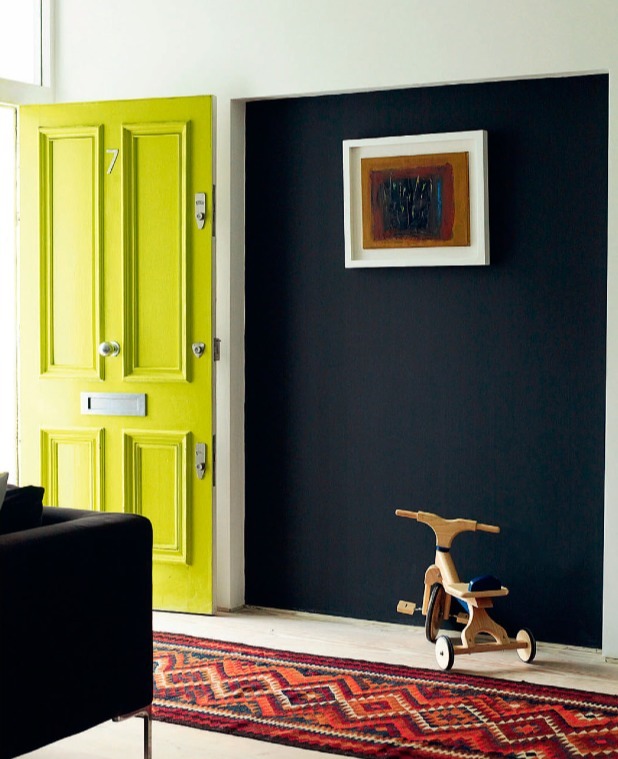 The neon door above works perfectly in an otherwise neutral and polished home. But if neon is a little too daring. 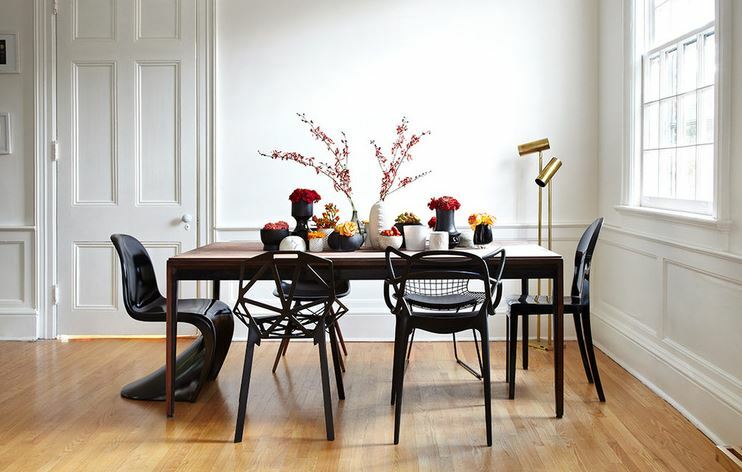 It doesn’t have to be the first thing you notice, a more subtle mismatch – as in the example below – works well in this airy space, the related-but-different black chairs keep things interesting. This rather beautiful, slick kitchen could feel look a little flat and cold, but not with that fun, over-sized pedant lamp. Does this type of fabricated and intentional meeting of opposites make sense to you? Or would you call this “tension” something else? I’m sure I’ve missed off loads of helpful hints. If you have any other suggestions or examples, feel free to leave a comment below. Next PostInterior Design Diploma at KLC: I’ve Submitted My First Project! Reblogged this on Flamingo Media Pr.